With the right amount of research, you can get a deal on almost anything. Planning a wedding is no exception! Given the seemingly endless ideas and tips available for soon-to-be brides and grooms, we’re here to help you sort out some of the best ways to stick to a budget for your big day. Three of our Community Financial team members (Rachel, Laura and Alex) offer tips on how they saved when planning their weddings. Laura suggests finding a dress you love, not a designer everyone knows. “If it looks beautiful on you, who cares who designed it or where you bought it? I was able to get my dress and veil for under $1,000 at David’s Bridal. Everyone complimented me on it,” she said. If on a tight budget, try to buy a dress off the rack instead of getting one custom made. This can save the bride hundreds of dollars. You should also research whether there are any resale shops or bridal outlets in your area. Some brides prefer to shop online for their wedding dress. If you go this route, just make sure the website is legitimate and offers free returns in case the dress is not what you expected. The best way to get an idea of the different styles out there is to go to an actual wedding dress shop. This way you can try on a variety of styles and see what works best for you. If you find your dream dress you can always write down the designer and item number and potentially purchase it online for a lower price. Finding a venue with a smaller price tag was one of Rachel’s challenges. “The cost of having it at Cobblestone Farm in Ann Arbor was around $1,600. It included the entire use of the barn, the bridal suite, access to the farm grounds, indoor tables and chairs, etc. I found it very hard to try and find a 'deal' on a banquet facility,” she said. Alex actually saved money on the venue he and his wife chose. “I knew that we would be spending a lot of money on the reception location. Luckily, the rental cost for Bell’s Brewery Eccentric Café came in well under what other places were charging, so we saved money immediately by picking Bell’s. Along with the rental fee for Bell’s, we also saved money by using the provided tables/chairs/linens. We didn’t have to pay extra for use of their staff either, since that was included in the facility rental fee,” he said. Photography costs range depending on which photographer you choose. The most important thing about choosing a photographer is making sure you like that person’s style and vision. Make sure you view their wedding photography before signing any contracts. Research is imperative when trying to pick the best photographer for your wedding. Photographers usually set their fees based on experience, time and travel. Photographers increase their prices each year as they gain more experience. One way to save money is to try to find a talented and up-and-coming photographer. You could get a great photographer at a fraction of the cost if that person is trying to build their portfolio. Most photographers charge based on the amount of hours they spend with you and your partner. One tip to save money is to ask the photographer to shoot for less time during the wedding day. Another money-saving tip is to research photographers located in your geographic area. Some photographers charge mileage fees if your wedding location is over 50 miles away from their home location. All our newlyweds suggest using professionals, but also asking around to see if you know someone who can take nice pictures. Both Alex and Rachel were able to utilize friends and college classmates who were photographers and wanted to build their professional portfolios. Laura spent much of her budget on her photographer. “You can’t re-take your wedding photos!” She said. A great way for guests to save money on gifts for the couple is to offer help with the wedding. Rachel had friends and guests help coordinate appointments and decorations. This way they could still contribute to the wedding without spending an arm and a leg on gifts. Flowers are usually an expensive part of any wedding. When trying to stick to a budget, consider buying wholesale flowers and putting together arrangements yourself for centerpieces and bouquets. Laura was able to spend less on flowers because she happened to have an expert in the family. “My mom used to be a floral designer and we made all the centerpieces, bouquets, boutonnieres and church flowers together. My aunt also has designing skills and helped my mom. We were able to get all the flowers at wholesale price, which saved money,” she said. Rachel took the same approach and did her flowers herself. “My mom bought our flowers wholesale. I made the vases to put them in, and my husband and I cut the stems and constructed the vases the night before the wedding,” she said. When it comes to decorations, consider using a social media site like Pinterest to get creative ideas. 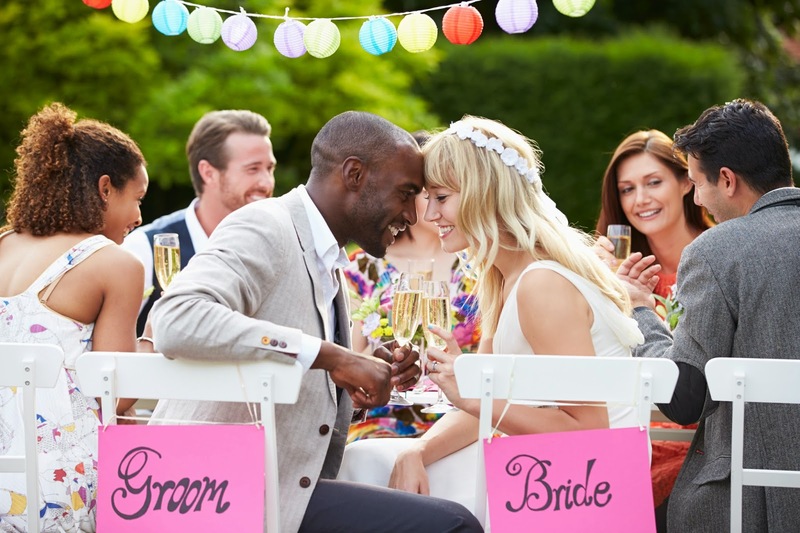 Having a “Do-It-Yourself” wedding can be time-consuming but also financially smart. Our brides and groom suggest repurposing and DIY-ing anything and everything you possibly can. Rachel saved about $3,000 just by building and making decorations with her husband. Laura decided to do DIY invitations. She said her invitations were simple and elegant. “I had invites that tri-folded into each other and the RSVP card tore off like a post card,” she said. Alex spent extra time figuring ways to make his invitations less expensive. “To save money, I designed the ‘Save-the-Date’ cards and invitations. To save further on the cost, we printed them using Vista Print,” he said. You could also consider using postcards for your “Save-the-Dates” to save money on postage. When it comes to your wedding, decide what your priorities are and splurge on those. Laura went a more expensive route with her hair and makeup, but was awfully glad she did. “I tried to go the family and friends route and it blew up in my face. Two weeks before the wedding I found myself without someone to do my hair or makeup. I found a GREAT salon and was so pleased with the results. I’m glad I went the professional route. They were able to airbrush my makeup on. My hair and makeup stayed beautiful all day and night,” she said. Rachel splurged on her DJ and a photo booth. Since she and her husband decided to go easy on the drinks by serving beer, wine coolers, pop, and water, they spruced up the other outlets for entertainment. Laura’s special touch was an arbor she decorated for the backdrop of her ceremony. “I decorated an arbor with flowers and garland. We put it behind the minister at the church and it was later brought to the reception hall. It was beautiful in the pictures. When everything was done, we took the flowers off and now it’s in the garden in my backyard. Every time I look at it, I think of that special day,” she said. At the end of the day, your wedding is for you! Don’t worry about all of the small details not getting done at your wedding. Just enjoy the day and realize that everyone is there to celebrate the two of you joining your lives together.